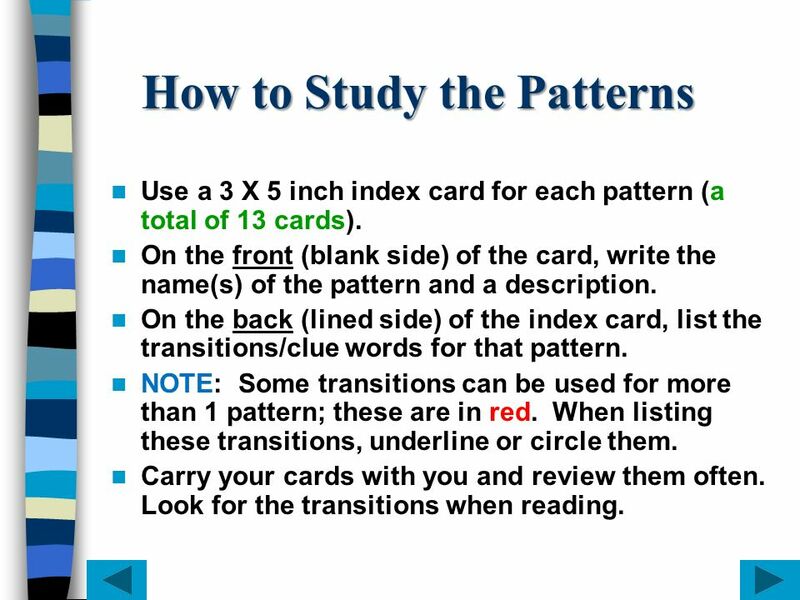 Use a 3 X 5 inch index card for each pattern (a total of 13 cards). On the front (blank side) of the card, write the name(s) of the pattern and a description. 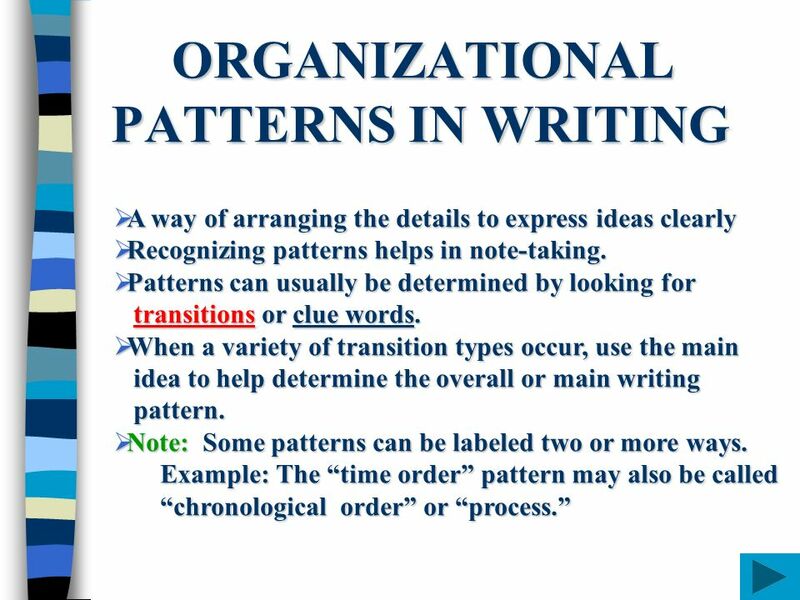 On the back (lined side) of the index card, list the transitions/clue words for that pattern. NOTE: Some transitions can be used for more than 1 pattern; these are in red. 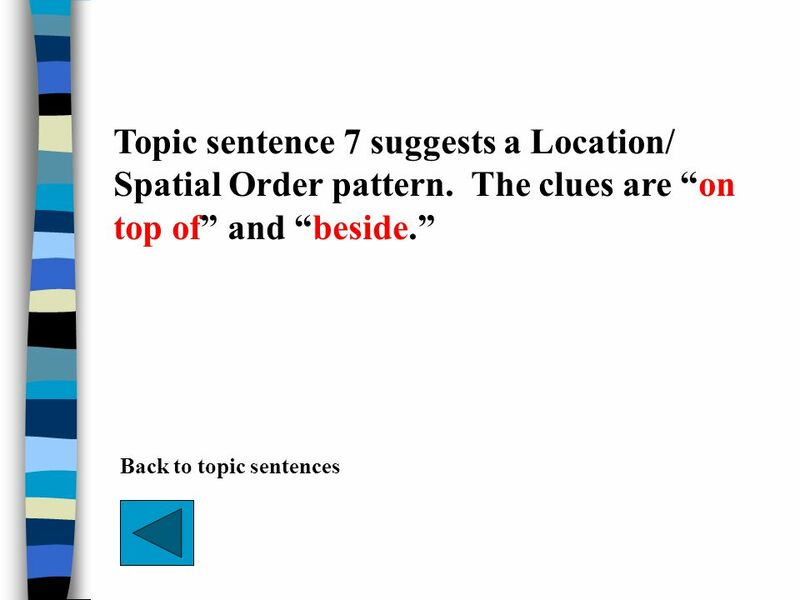 When listing these transitions, underline or circle them. Carry your cards with you and review them often. 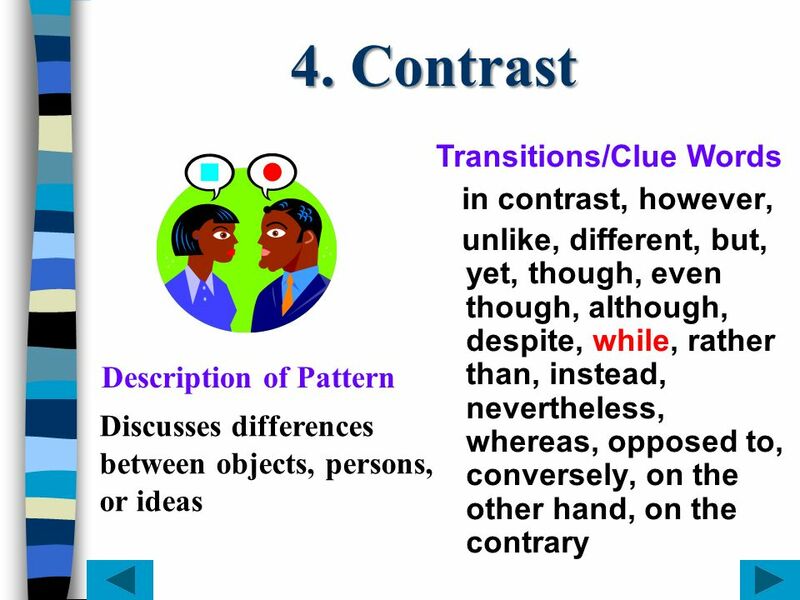 Look for the transitions when reading. 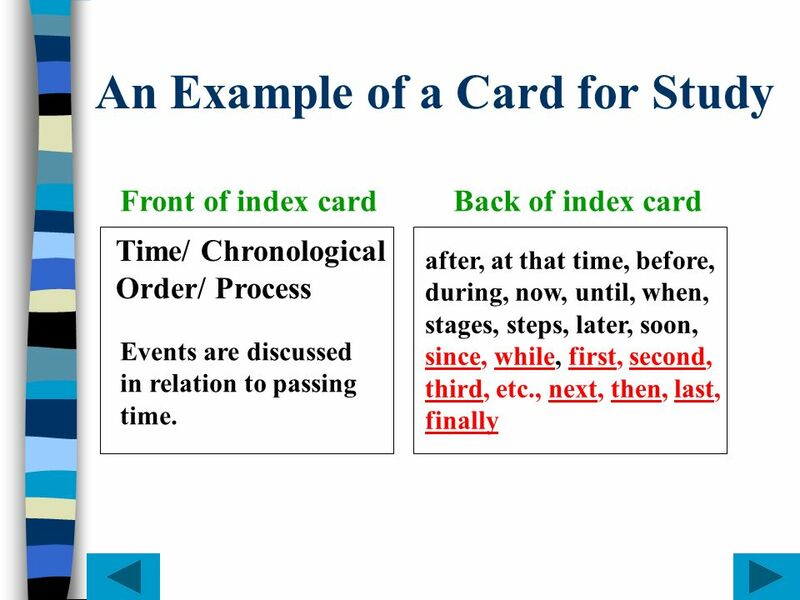 Front of index card Back of index card Time/ Chronological Order/ Process after, at that time, before, during, now, until, when, stages, steps, later, soon, since, while, first, second, third, etc., next, then, last, finally Events are discussed in relation to passing time. 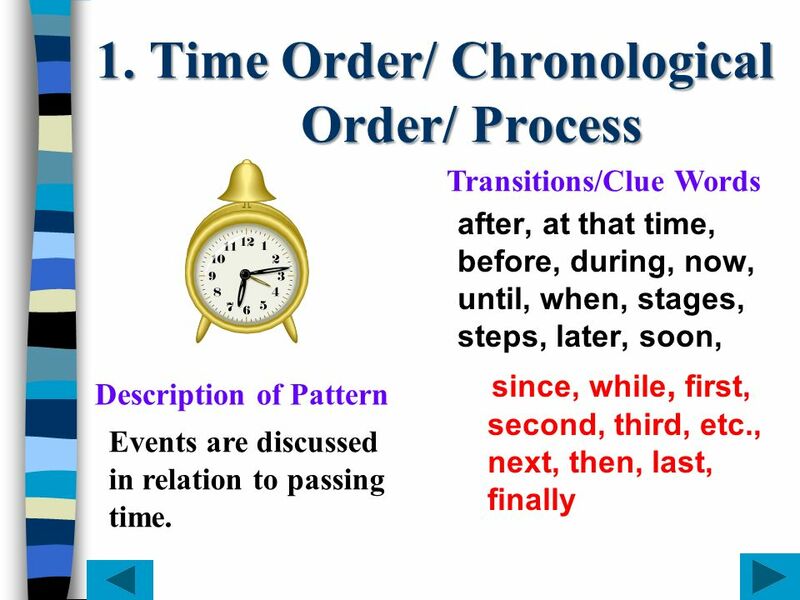 Transitions/Clue Words after, at that time, before, during, now, until, when, stages, steps, later, soon, since, while, first, second, third, etc., next, then, last, finally Description of Pattern Events are discussed in relation to passing time. 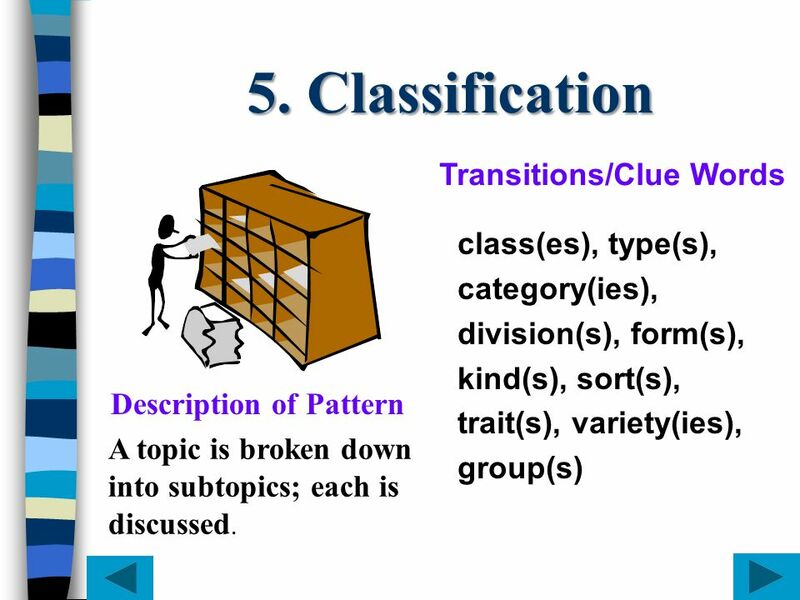 category(ies), division(s), form(s), kind(s), sort(s), trait(s), variety(ies), group(s) Description of Pattern A topic is broken down into subtopics; each is discussed. There are several things you can do to protect your home against burglars. First, get a burglar alarm. Second, buy a big dog, like a Rottweiler. Third, put bars on all your windows. Next, build a high fence around your property. Then keep a gun in your home. Finally, hire a security guard. Look at the transitions used to introduce the details. Would the pattern of this paragraph be referred to as Time/Chronological order OR Simple listing/Enumeration? 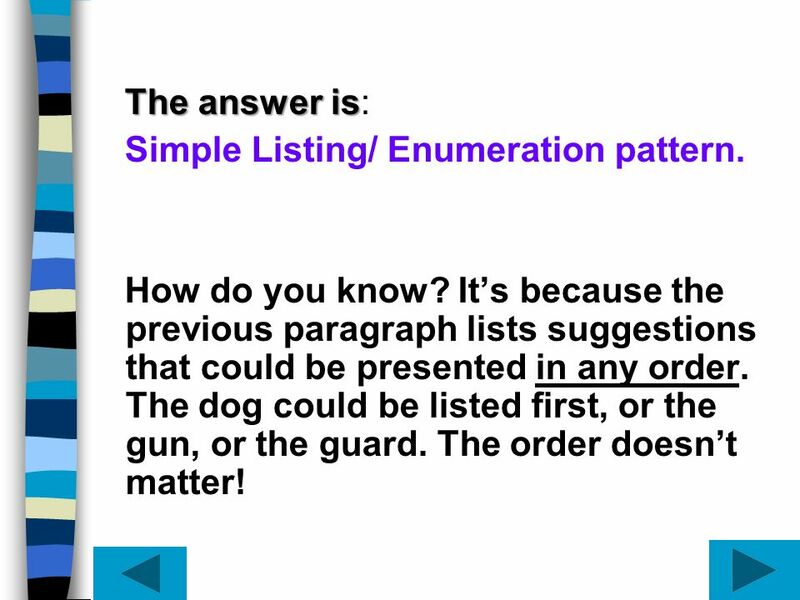 12 The answer is: Simple Listing/ Enumeration pattern. How do you know? It’s because the previous paragraph lists suggestions that could be presented in any order. The dog could be listed first, or the gun, or the guard. The order doesn’t matter! 13 Look at the transitions used to introduce the details. There are several steps you need to follow in order to make scrambled eggs. First, get together your ingredients and your utensils. Second, heat some butter or oil in your pan. Third, crack open the eggs and mix them with salt or other seasonings. Next, pour the mixture into the pan. Then, cook as long as you like. Finally, empty the cooked eggs onto a plate and eat them. Look at the transitions used to introduce the details. Would the pattern of this paragraph be referred to as Time/ Chronological Order OR Simple listing/Enumeration? 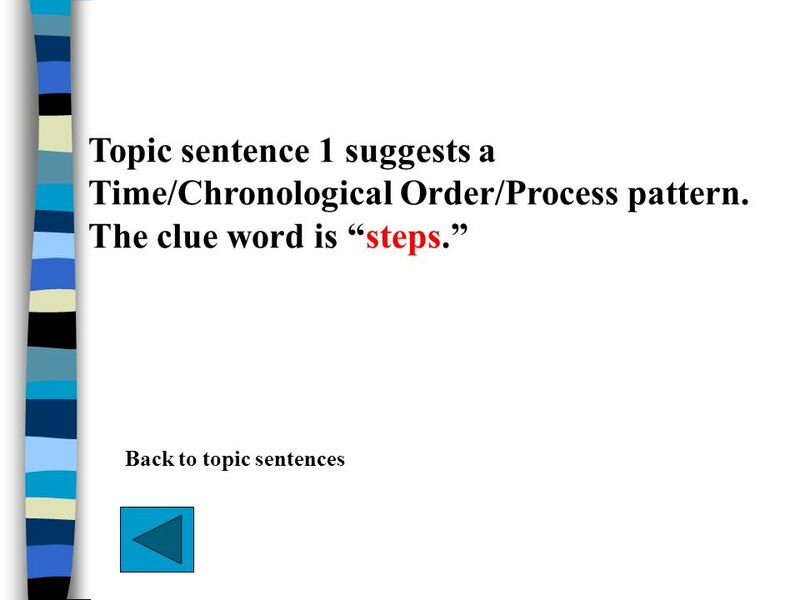 14 The answer is: Time/ Chronological Order. 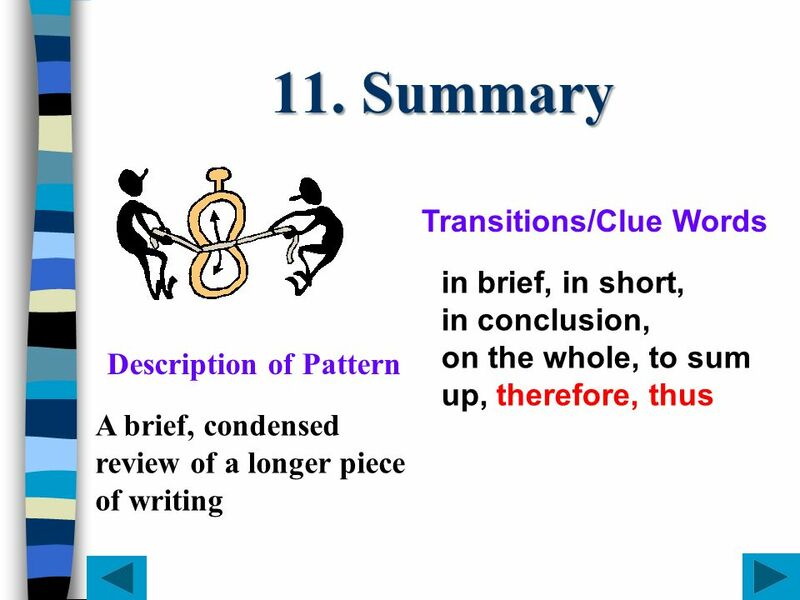 Note that the same transitions—first, second, third, next, then, and finally-- are used in both sample paragraphs. 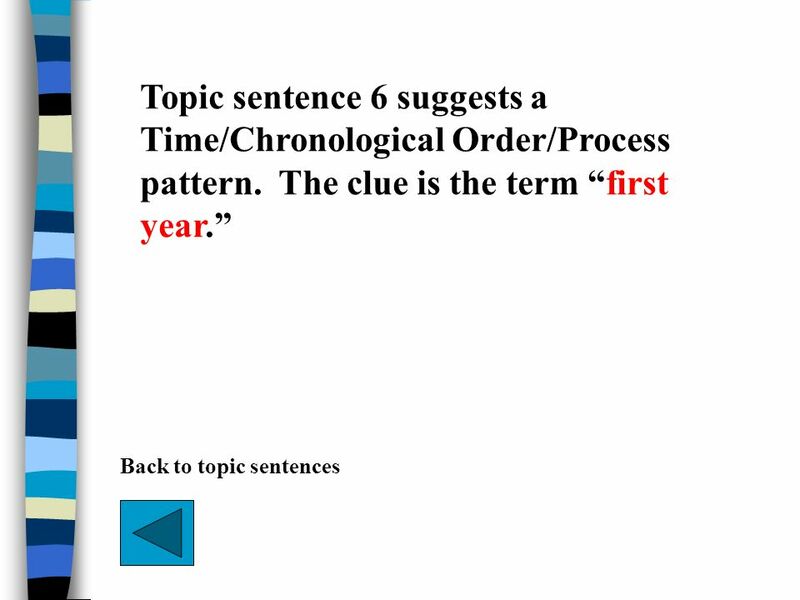 The answer is: Time/ Chronological Order. How do you know? 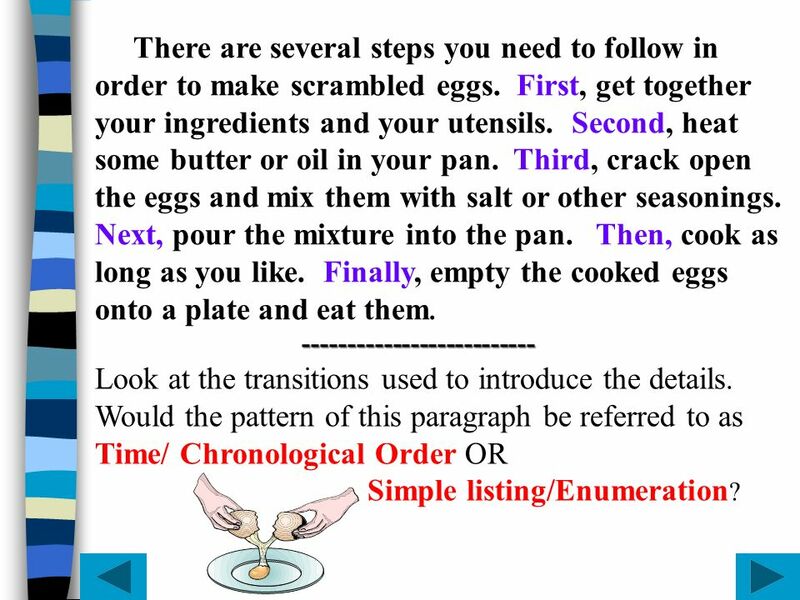 It’s because in the previous paragraph, the details provide a list of steps that must be followed in order to make eggs that can be eaten. You wouldn’t, for example, cook the eggs before cracking them open. 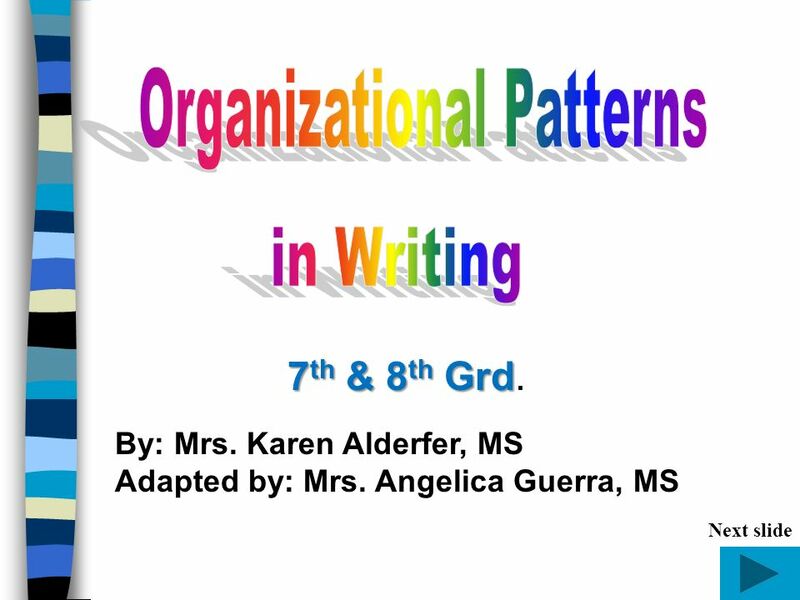 In the sample paragraph, the order in which the details are is important. 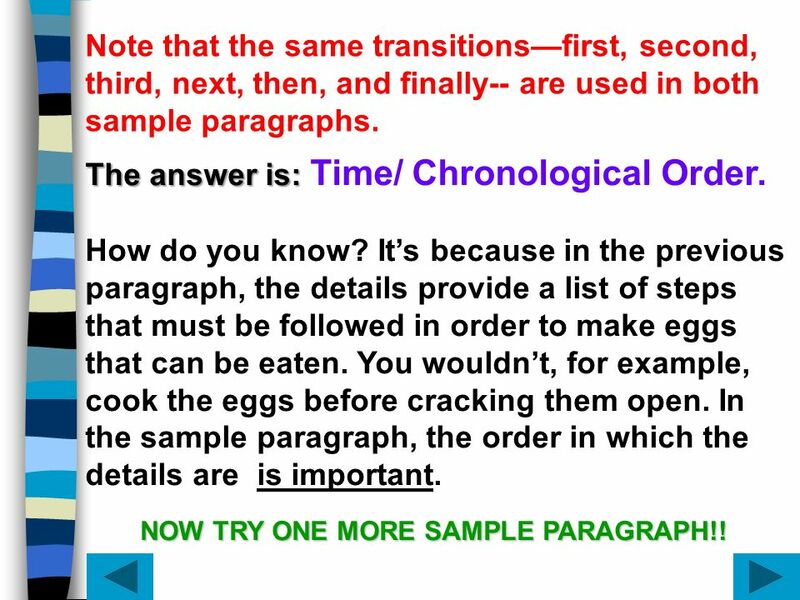 NOW TRY ONE MORE SAMPLE PARAGRAPH!! There are several things you need to bring along with you each time you come to class. First, you should have paper. Furthermore, you need a pen to take notes with. Moreover, you need to have your textbooks. 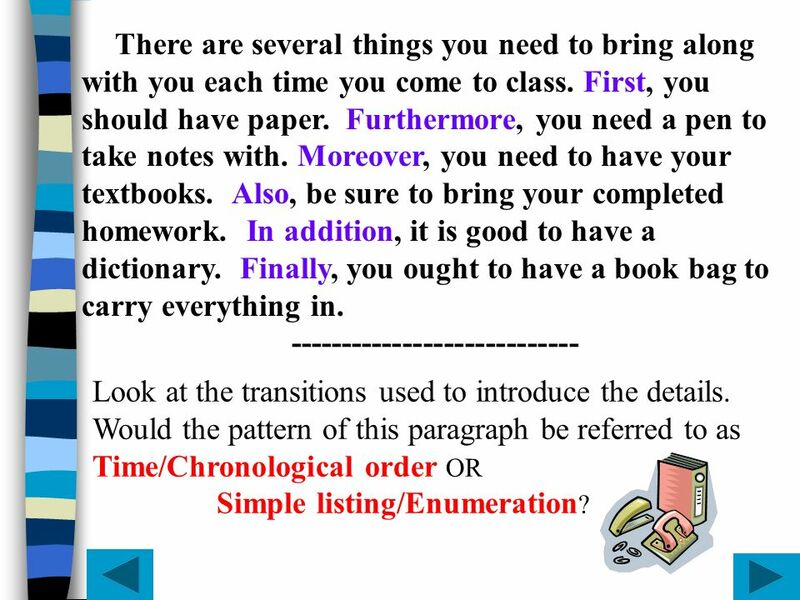 Also, be sure to bring your completed homework. In addition, it is good to have a dictionary. Finally, you ought to have a book bag to carry everything in. Look at the transitions used to introduce the details. 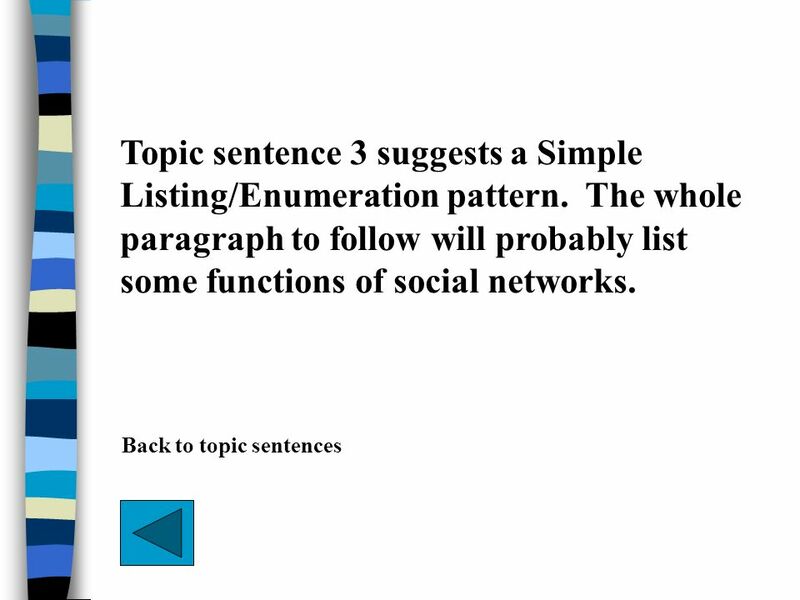 Would the pattern of this paragraph be referred to as Time/Chronological order OR Simple listing/Enumeration? 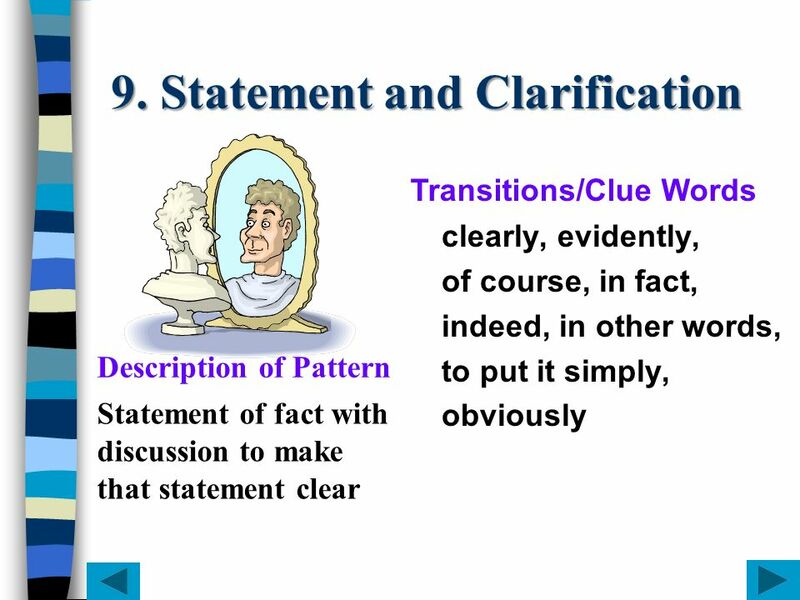 Note the transitions words—first, furthermore, also, moreover, in addition, and finally. 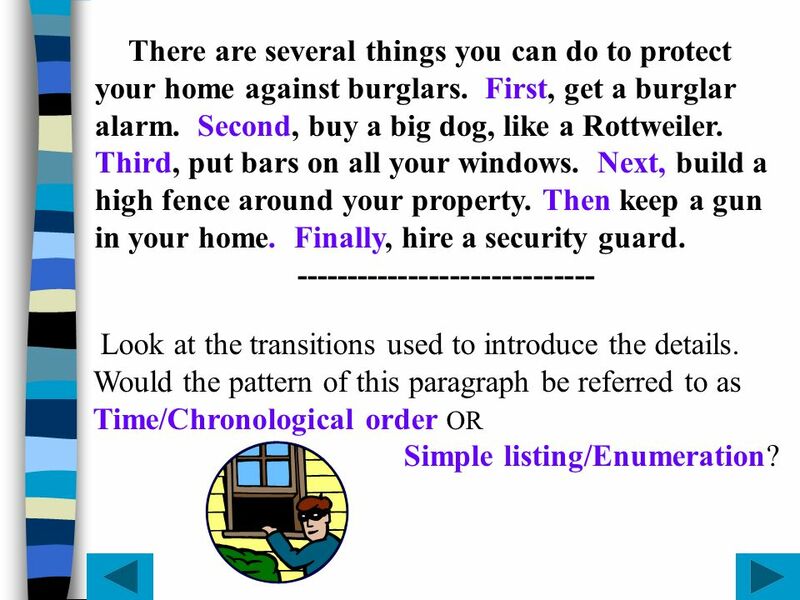 “First” and “finally” can be used for time order or for simple listing/enumeration. The other transitions are used only for listing. 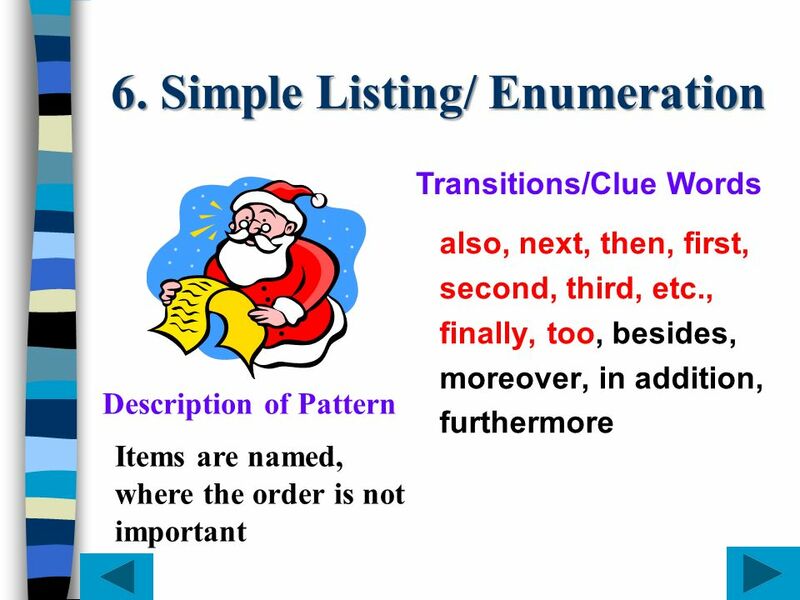 The answer is: Simple listing/Enumeration. 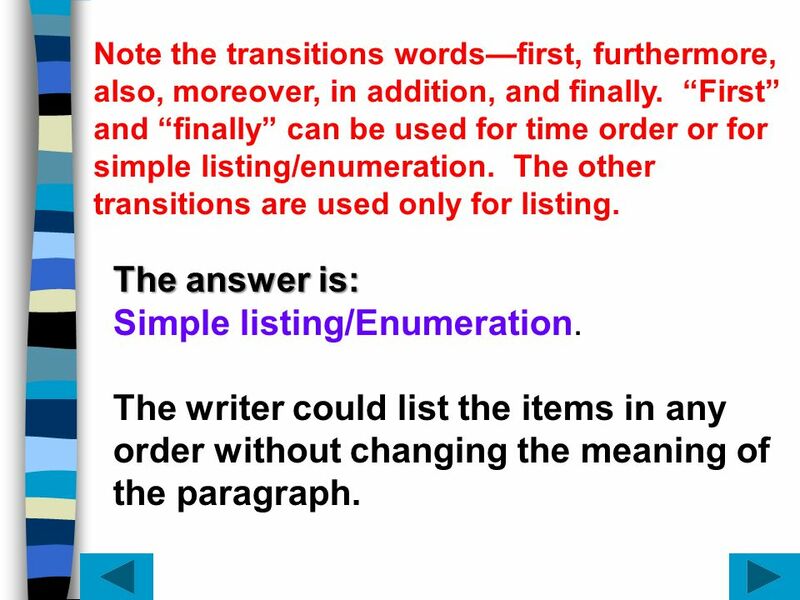 The writer could list the items in any order without changing the meaning of the paragraph. 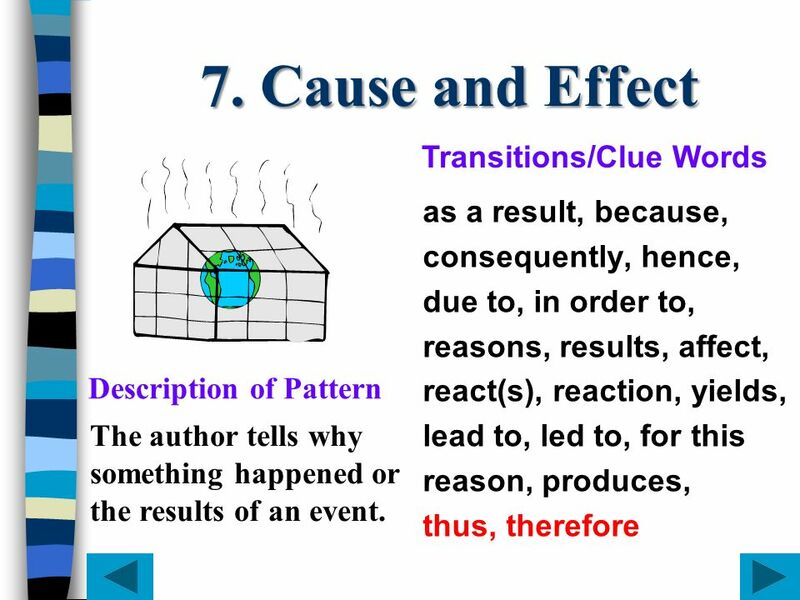 consequently, hence, due to, in order to, reasons, results, affect, react(s), reaction, yields, lead to, led to, for this reason, produces, thus, therefore Description of Pattern The author tells why something happened or the results of an event. 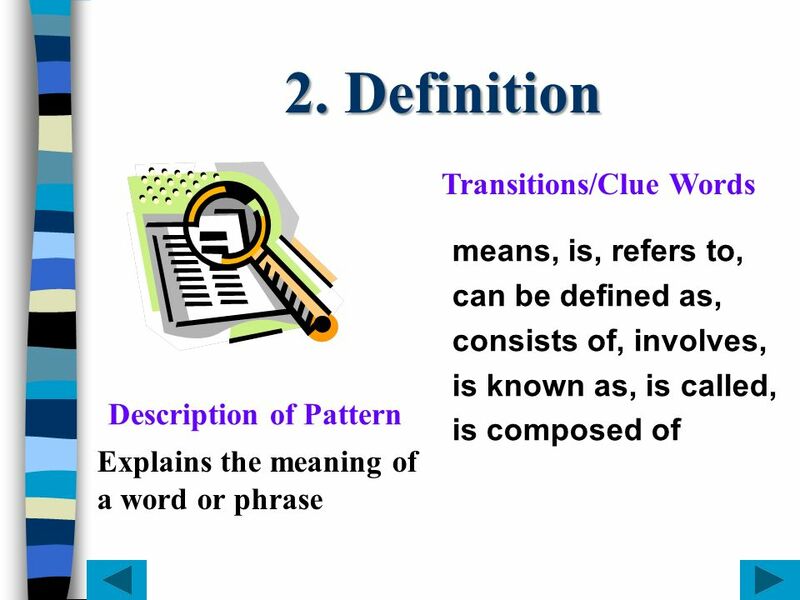 Transitions/Clue Words for example, for instance, such as, to illustrate, including, specifically Description of Pattern A general statement is given with examples to illustrate the idea. 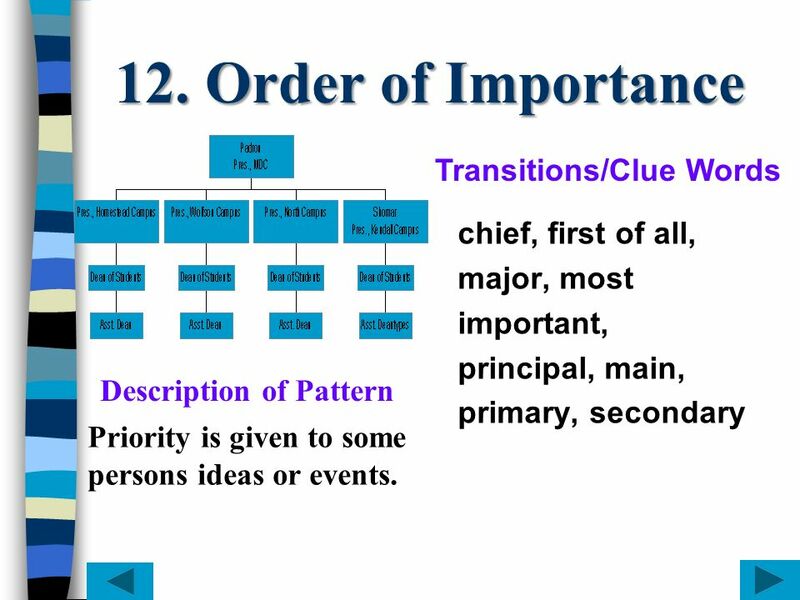 major, most important, principal, main, primary, secondary Description of Pattern Priority is given to some persons ideas or events. When asked why they are in college, students give a variety of answers. Some say they went to college to avoid having to start working full time. Others say they went when they found out their friends were all going to college. 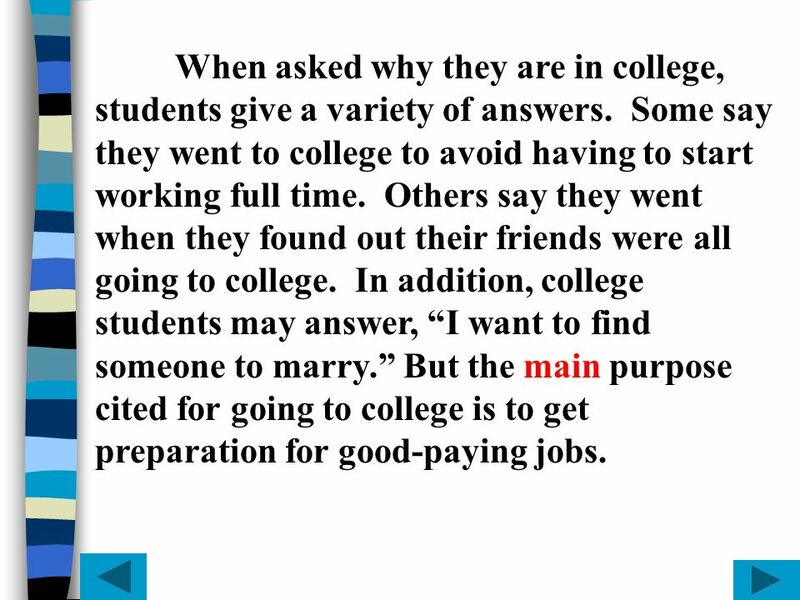 In addition, college students may answer, “I want to find someone to marry.” But the main purpose cited for going to college is to get preparation for good-paying jobs. 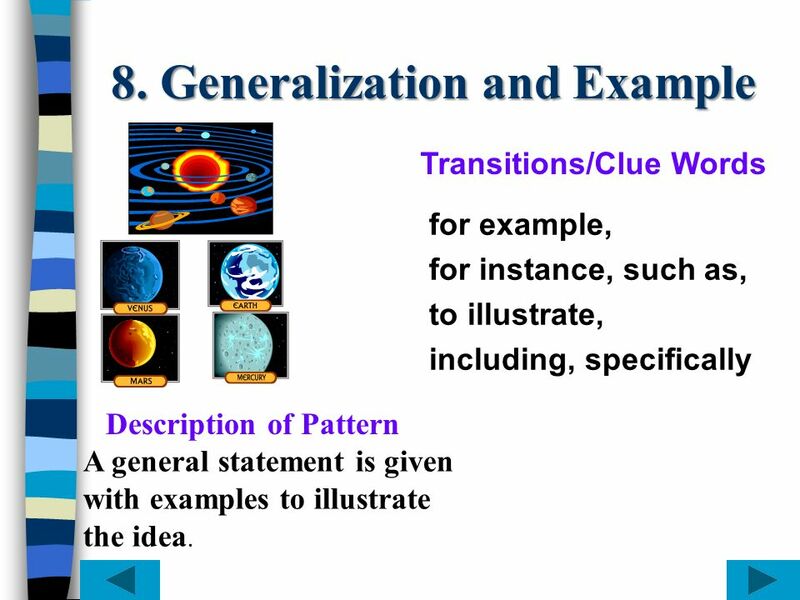 transitions for this pattern. 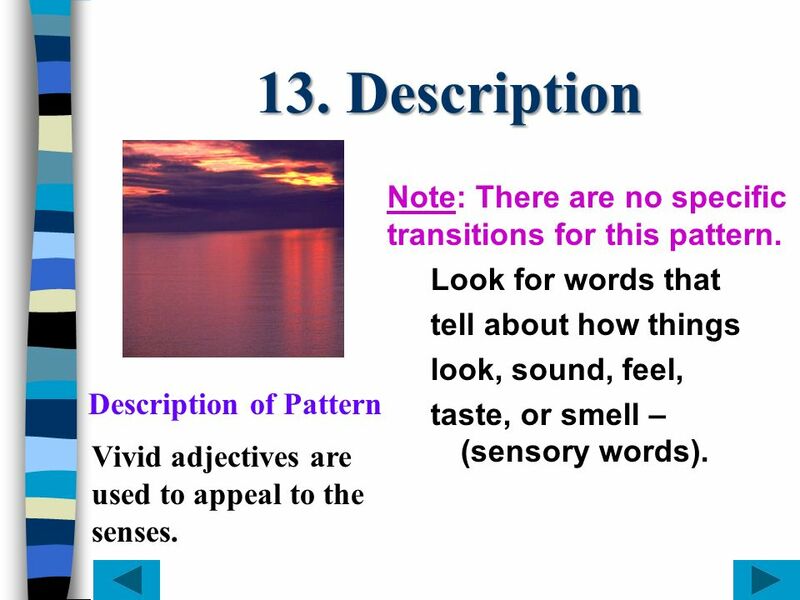 Look for words that tell about how things look, sound, feel, taste, or smell – (sensory words). 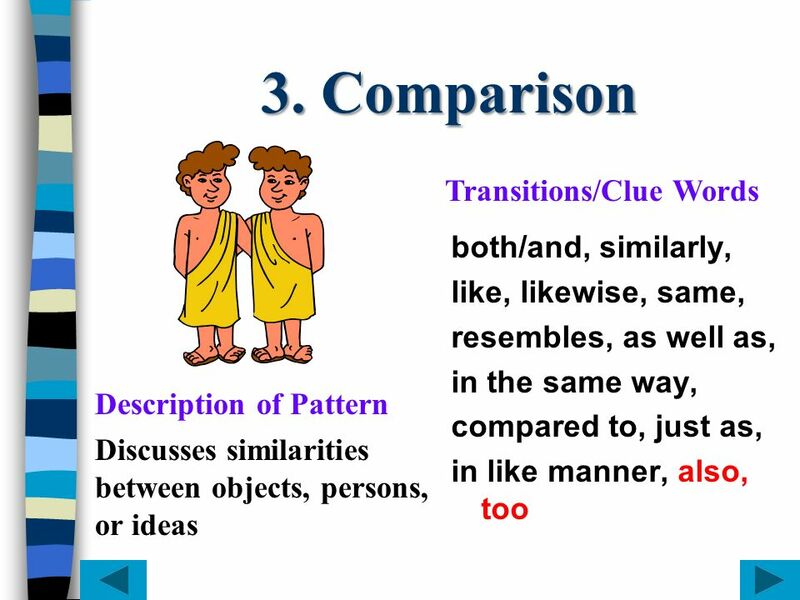 Description of Pattern Vivid adjectives are used to appeal to the senses. 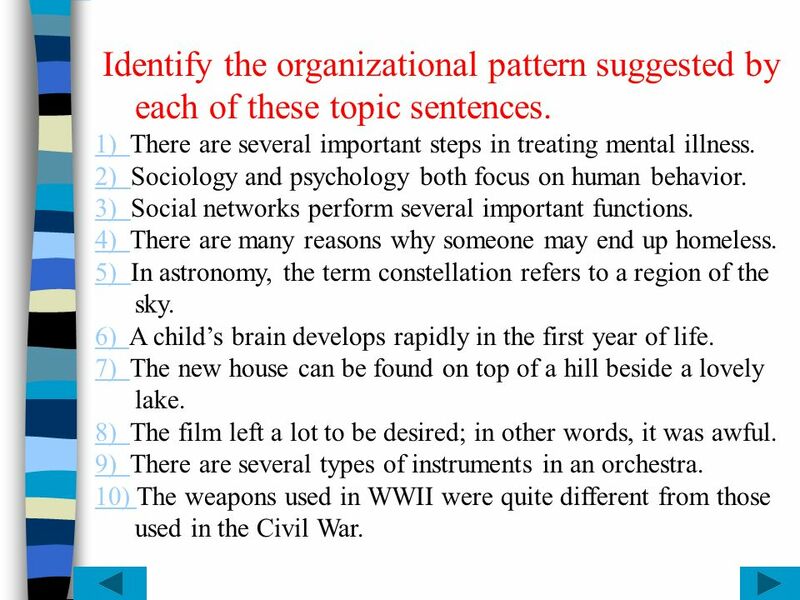 25 Identify the organizational pattern suggested by each of these topic sentences. 1) There are several important steps in treating mental illness. 2) Sociology and psychology both focus on human behavior. 3) Social networks perform several important functions. 4) There are many reasons why someone may end up homeless. 5) In astronomy, the term constellation refers to a region of the sky. 6) A child’s brain develops rapidly in the first year of life. 7) The new house can be found on top of a hill beside a lovely lake. 8) The film left a lot to be desired; in other words, it was awful. 9) There are several types of instruments in an orchestra. 10) The weapons used in WWII were quite different from those used in the Civil War. 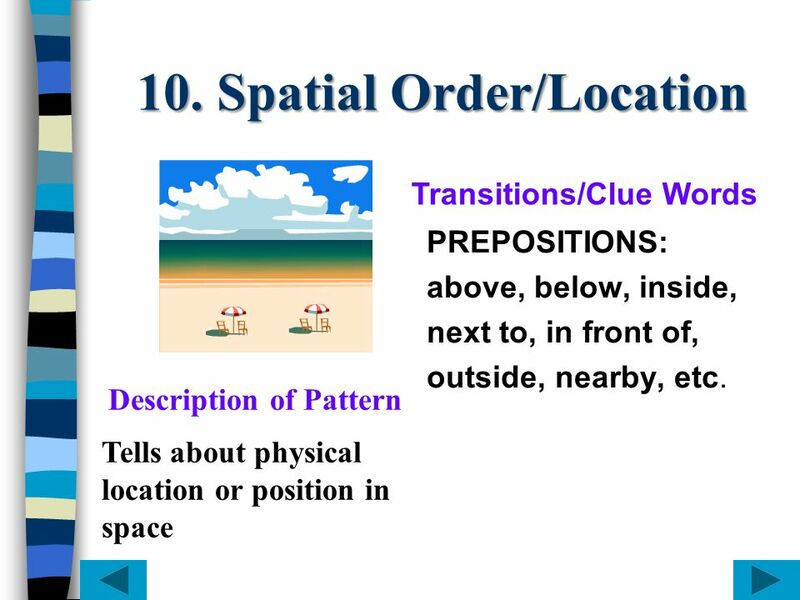 © 2005 Pearson Education Inc., publishing as Longman Publishers The Skilled Reader (Updated Edition) by D. J. Henry Chapter 8: Transitions and Thought. So, what is a transitional device? 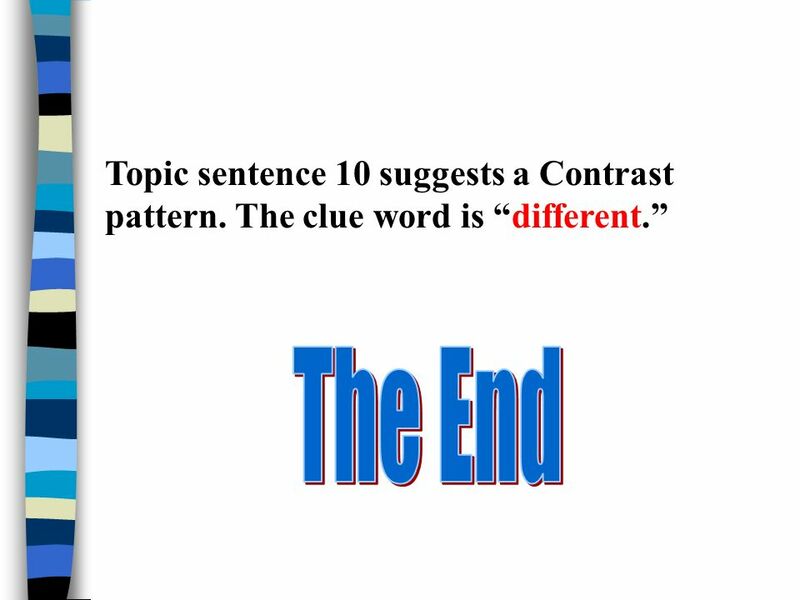 A transitional device is a word or a phrase which helps connect your ideas together when you write. Connectors. Using connectors will allow you to express your ideas better, and allow your writing to flow. 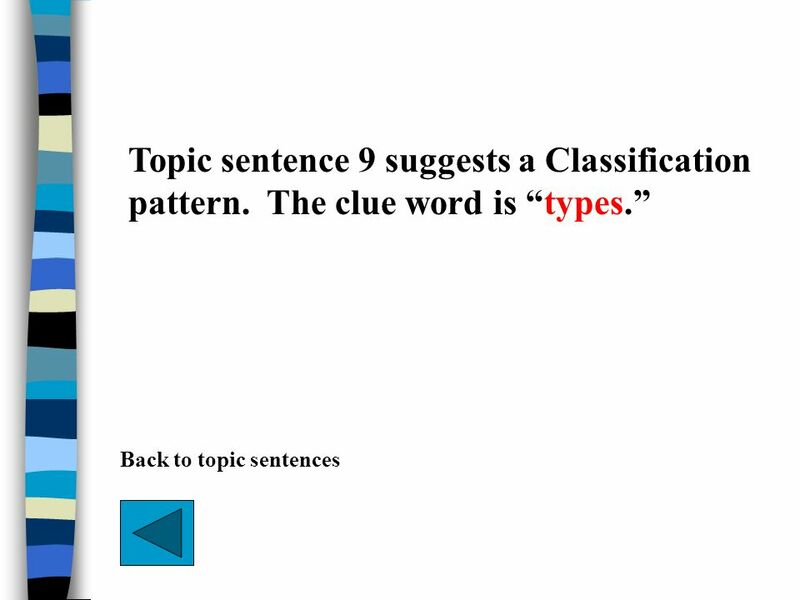 Connectors can be classified by grammar (coordinating. 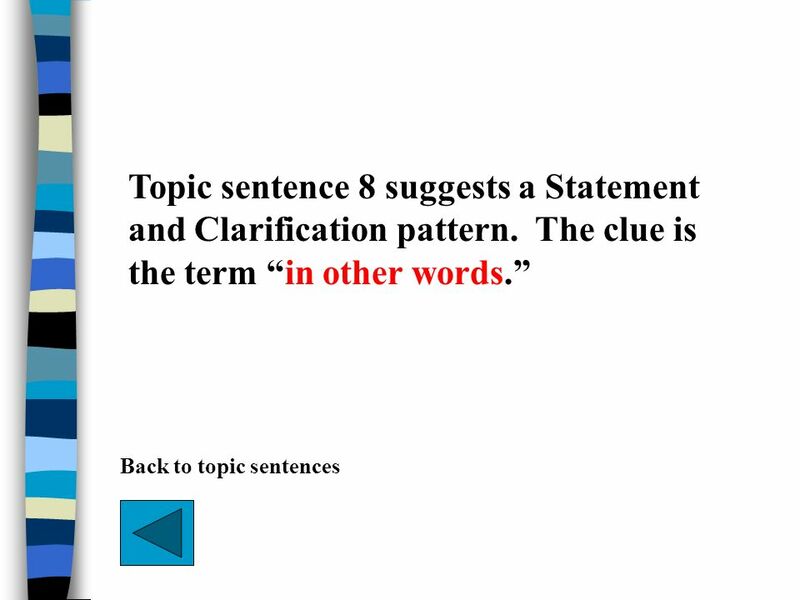 Ah, Those Transitions Connecting Ideas Transition words: Provide more information Provide an example Provide a cause or reason Provide a result or an. Transitions The Writing Center University of North Carolina at Chapel Hill. Body Paragraphs The largest portion of an essay. 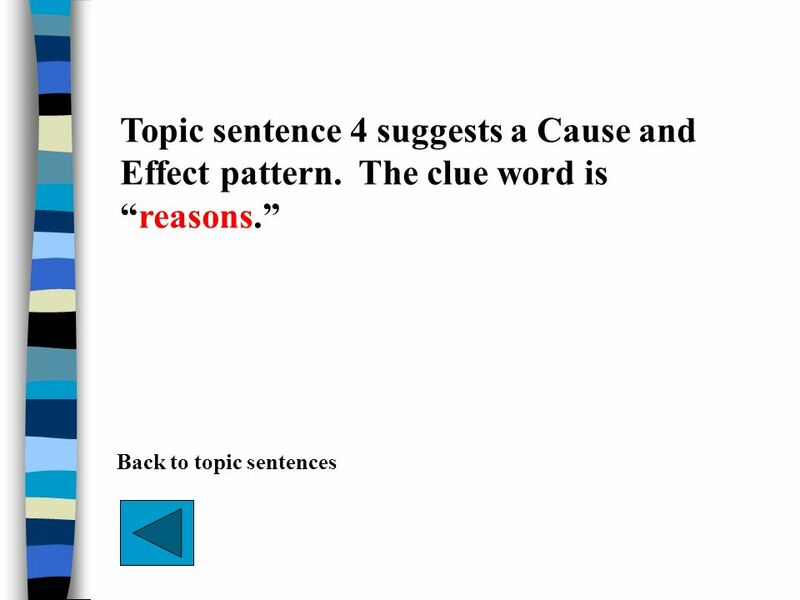 Typically ______ paragraphs, but can be two. 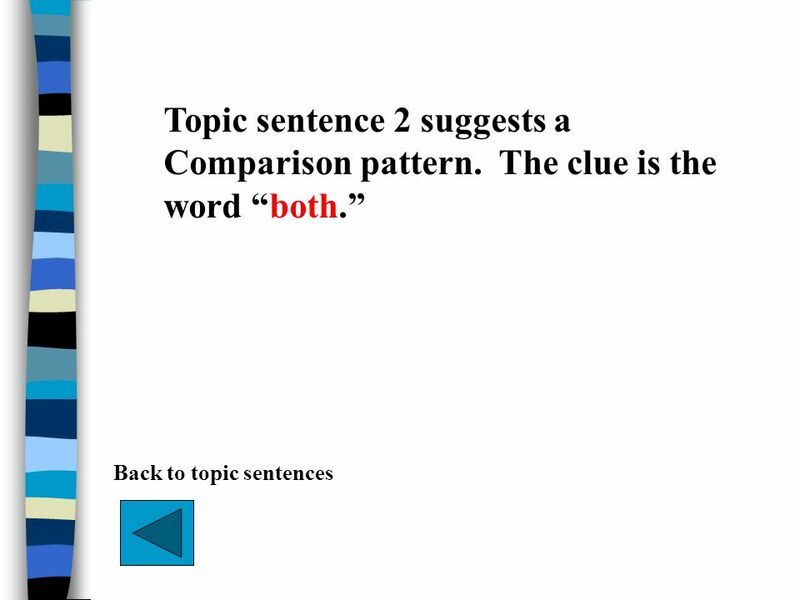 3 Parts  Topic Sentence with Transition  Supporting Details  Clincher Sentence. 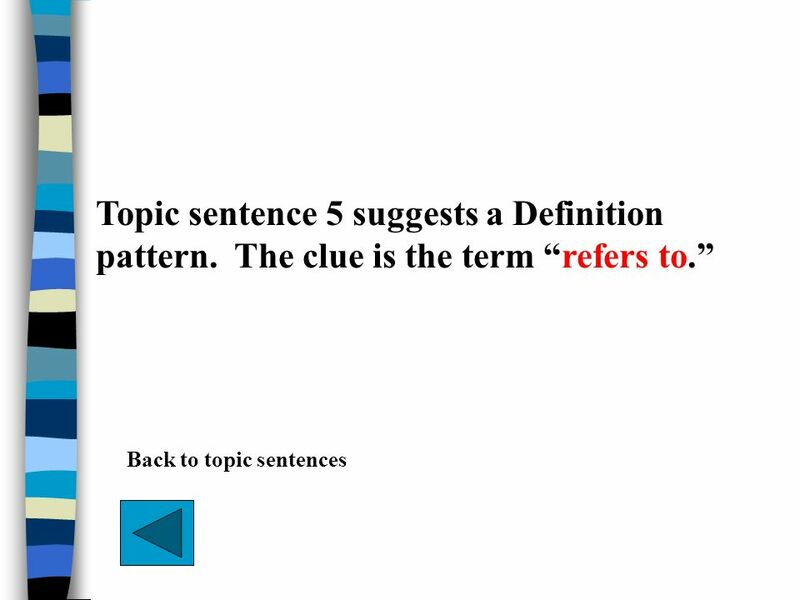 Accuplacer Reading The reading comprehension section is designed to measure how well you are able to understand what you read. Some questions involve.